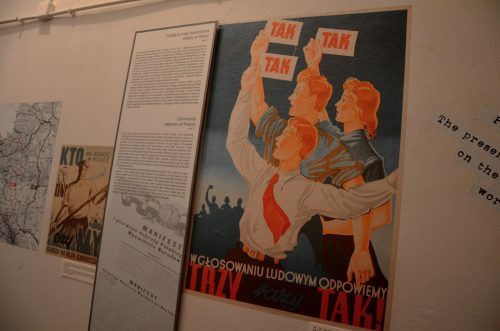 At the turn of the 40s and 50s, the Polish propaganda exploited particularly intensively slogans of “fight for world without war”. Its blade was aimed particularly at the accused of “imperialism” Americans and the suspected of “neo-fascist” attitude authorities of the Federal Republic of Germany. On the wave of the “fight for peace”, employees undertook “peace guards” at their workplaces, during which they made production commitments and offered their services “after hours”. During celebrations organised by the state authorities, one could spot such slogans as: “Bierut – Stalin – Peace”, “As an answer to atoms, we construct new homes” or “Peace shall conquer war”. Also newspapers informed of the necessity to fight for peace, saying about “tonnes of steel and wagons of coal being a blow against warmongers”. The climax in the “fight for peace” was an action of collecting signatures for the Stockholm Appeal. During the World Congress of Peace Advocates held in Stockholm, its signatories demanded “outlawing of atomic weapons as instruments of intimidation and mass murder of peoples”. They expected also “strict international control to enforce this measure” and claiming a war criminal “any government which first uses atomic weapons against any other country whatsoever”. Signatures were collected from 10 May to 18 June 1950. The first signatory was the President of the Polish People’s Republic – Bolesław Bierut. Rallies and meetings were organised in the entire country. What is more, press and the Polish Film Chronicle were involved to raise awareness of the action. The authorities established Peace Committees on every level “from central to house”. Their members campaigned in two- or three-person groups, going from door to door, to visit every single citizen of Poland. As a result of the mass action, approx. 18 million signatures were collected, listing by the way persons who dodge to support the appeal in Secret Service’s registers as “enemies”. The action which was supposed to look spontaneous and unforced was actually steered by the Soviet Union authorities who by supporting the anti-nuclear message of the appeal, tried, in fact, to level the American military dominance in this respect. Following the outbreak of the Korean War, the “pro-peace” and anti-American propaganda grew in strength. 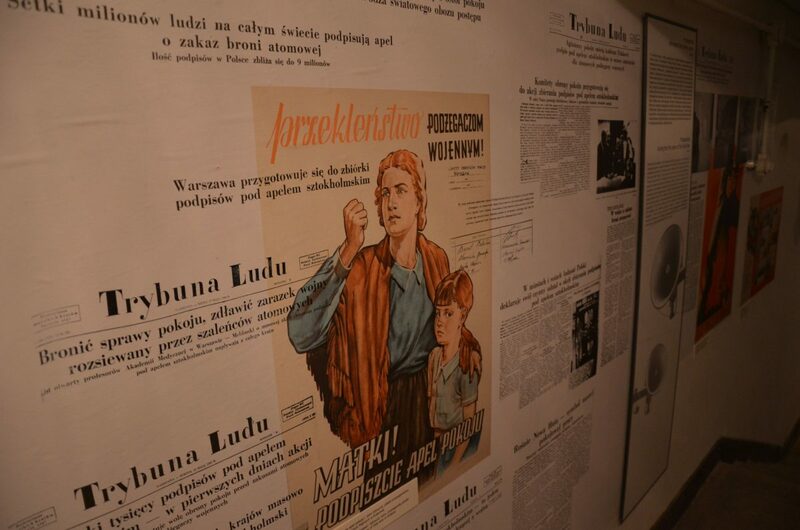 Materials of the Polish Film Chronicle attacked in an undemanding manner the American army supporting the South Korean forces. They were called “Nazis”, “war criminals” while their activity towards the Koreans – “crimes of new SS men” or “selection made according to Nazi standards”. No less were the Americans criticised with reference to Poland. They were accused of such operations as transferring saboteurs to the Polish territory or dropping the crop-devastating Colorado potato beetle. 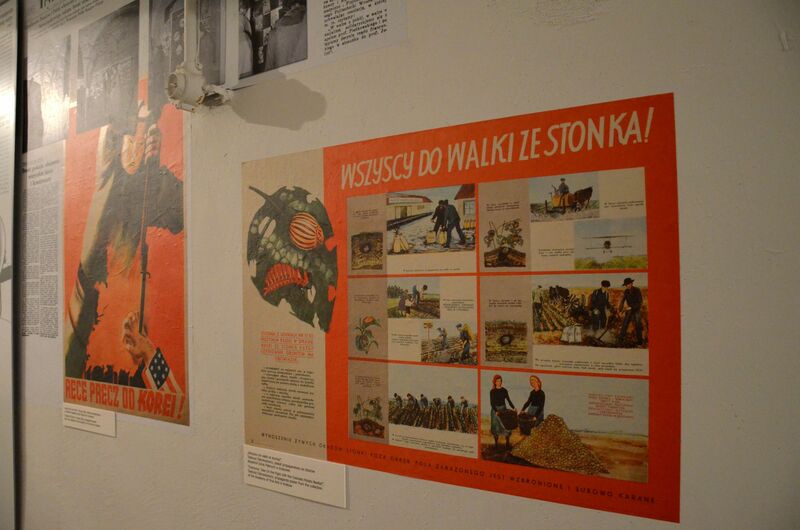 In 1952, the Warsaw Arsenal hosted a propaganda exhibition titled “This is America”, aimed at showing the United States in the worst light possible. 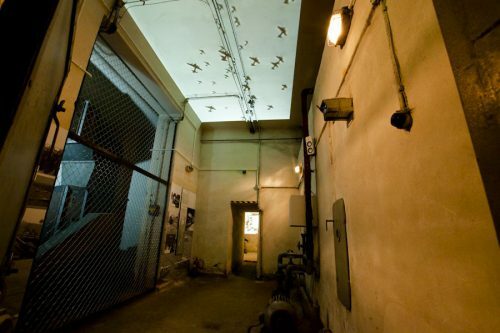 It showcased dioramas of American weapons, espionage equipment, Ku Klux Klan’s crimes and the greediness of Wall Street bankers. The exhibition was extremely popular, however – contrary to the authors’ intentions – it did not raise resentment. People marvelled at the blessings of American technology and relished the American pop culture, so much different from the grey unified world behind the “iron curtain”.